Monday through Sunday, I’m up by 5, immediately jumping into a movement circuit and then whatever creative work I’ve prioritized for the day. To an outsider, it would appear I have discipline down. With few exceptions, I fit in my daily workout, eat well, and fend off procrastination. Still, a part of me is always trying to rebel. I finish breakfast and want to keep on eating- just for the sport of it. Its worse on those occasional trips for ice cream. Similarly, I’ll set up a word document to begin writing and feel a pull to do anything but focus on creating a coherent message. I want to check email, write fitness programs, call colleagues, read articles, or find any other excuse to be busy while less productive. When it is time for my workout, I often feel immense inertia trying to hold me still. Even biking to work sometimes invites the flood of wimp instinct. My commute is 10-minutes by car and 20 by bike. The time difference is negligible, yet my inner wimp still makes himself heard from time to time. Without a doubt the most fulfilling pursuits of my life have been writing, learning, creating courses, and the pursuit of health and yet I’m still constantly tempted to skip these in favor of more passive entertainment. 5 pm my level of production leaves me gratified and capable of booting down. I shudder to think what my life would have been had I made it a habit to give in. This is part of the secret to greater willpower: vivid clarity about how painful it would be to choose the opposite, easy path. Because you don’t do the opposite choice once. You do it and it becomes a habit. You skip that planned workout and subconsciously give yourself permission to do it again and again. Your inner wimp wins and you are tortured all day with regret. Your inability to fight for 15 minutes plagues you at the moment and defines you over a lifetime. Willpower is the ability to do what you know you should. It is the ability to be the person you want to be, rather than an impulsive, whiny child. It is the power to create your life, rather than the entitlement for life to bend and acquiesce your immediate desires. Willpower goes by many names: grit, discipline, delayed gratification, self-mastery, tenacity, awesomeness. Regardless of what you call it, studies indicate that willpower is the primary determinant of happiness and success in life. The famed 1960’s Stanford Marshmallow test put hundreds of four and five-year-olds in a room with a single marshmallow. They could eat the marshmallow or wait the fifteen minutes it took researchers to return and be rewarded two marshmallows for waiting. Participants were tracked over the next four decades and those who waited fifteen minutes were healthier, happier, and more successful by every metric. Similarly, in the 1940’s, Harvard conducted a study1 to see how long individual college sophomores would stay on a steeply inclined treadmill traveling at high speeds. Some jumped off after little more than a minute. The majority made it around four minutes. Scientists contacted all the study participants every two years over the next 60 to collect data and prompt a lifestyle questionnaire. Like the Stanford test, they found that those who persisted longer were more successful and better psychologically adjusted. Regardless of luck or fortune, chaos repeatedly happens to us all. Those with willpower persist and practice the discipline necessary to weather life’s storms and continually grow. Most essentially, those with discipline will almost certainly practice better health practices, a tendency that makes them more capable and emotionally resilient to whatever life throws at them. Willpower is like a muscle in that it fatigues when used consistently and can be strengthened over time. Unfortunately, this breakthrough realization has often been used to discount its utility. Rather than set out to grow stronger, most excuse the cookie binge because it is human nature to indulge at the end of a hard day. True, like our muscular endurance, willpower is finite. It is highly unlikely that based on a momentary decision you will go from never working out to crushing CrossFit every day for the next 30 years. These things are a process. However, we should all be going to great lengths to train willpower. In this bizarre world where indulgence and instant gratification becomes evermore normal, we should make delayed gratification the foremost objective of our educational and parenting strategies, while creating daily discipline exercises for ourselves. Most of society floods us with messages telling us that “snoozing is great.” “It is human.” “It is what everyone does.” “It is normal.” And they are right. It is normal. Just like its normal to eat predominately processed, sugar infused treats and fast food- just as its normal to rarely exercise- just as its normal to sit and scan your phone all day. I’d like to offer a different message. These things are the norm and will continue to be. However, they won’t make you happy. You can feel better about yourself by hiding behind how normal your behavior is, but it will continue to limit your potential and impede your development. It will preclude your greatest impact, eliminate countless profound experiences, and leave you knowing you were capable of so much more. Then you, like all of us, will die. Time is all we really have and yours was spent rather than invested. Most of my work focuses on combatting negative cultural trends by clarifying a better path and seeking the secrets of successful change. Yet all of my advice has been useless if we can’t accept personal responsibility and practice a degree of willpower. Learning about habits will only take you so far. Simplifying will only take you so far. Eliminating chips and soda from your home will only take you so far. Until you confront your own personal expectations and chase self-mastery, your efforts are futile. Quit acting like you don’t know what you need to do. Quit acting like you are powerless to this craving. Quit telling yourself that discipline is easier for other people, or that you just have an impulsive personality. I don’t care if it is nature or nurture that brought you to this point in your life. My only concern is delivering a message that moves people in the right direction. It doesn’t matter if your parents fed you pop-tarts and let you play video games all day. What matters is you can change. You have the power and no one else is going to step in and do it for you. My point is not that you should work maniacally or live a monastic life of self-denial. Rather, you should create the discipline to be intentional with how you spend your life. You should work to create the discipline to be healthier so that you have more years and more life in those years. You should have the willpower to train your emotions so that you treat people the way you wish you could. You should work to create the purpose and projects that honor your short time. Behaving in the way you want to behave starts with committing to training discipline. But how? You could wake to movement, take a cold shower before work each day, create a meditation habit, or add any of billion small daily discipline exercises. Plan ahead, start small, adapt, and add more over time. Whatever you decide, the most important part of building discipline is to never allow yourself to not follow through on a plan. If you plan to workout, you have to. Even if your boss was a jerk today. If you said you wouldn’t snooze the alarm, you can’t. Planned to not check email and social media until lunch each day? Then don’t. Too tired and grumpy for that cold shower? Shut up and get in. 99% is a wimp. So often negative perceptions allow us to talk ourselves out of behaving like we’d like. There is a simple trick- the thousand-dollar test. You can’t go anymore. You’re just too tired. You aren’t feeling it today. If someone offered you a thousand dollars to do what you’d planned to do, would you finish? I thought so. It is a simple way to reframe and reveal the lie behind your sense of powerlessness. What presented as a lack of ability is actually a lack of immediate purpose. While you can get started training discipline today, your efforts will eventually stagnate. Despite your immense power, the reality is that there will be times you fail. This is why it is so essential for you to make it a habit to learn and grow. This inclination promotes learning from failure and persisting past roadblocks. It opens your eyes to the benefit of other people’s experience. For more help on your journey to train willpower, check out my new Willpower and Resiliency Course. For less than $10 you’ll gain a better capacity for willpower- the primary determinant of your ability to be the person you want to be. 1. Catarina Lino, 'Is Grit the New It? Developing Your Passion and Practicing Perseverance." Positive Psychology Program. accessed July 24, 2018. For a universal champion, Brock Lesnar doesn't show up to WWE events very often. On Raw this week, Universal Championship contender Roman Reigns started the show by pointing out that Lesnar seems more interested in his upcoming UFC match than the WWE Universe. While Lesnar's “advocate” Paul Heyman arrived to belittle Reigns, Lesnar was suspiciously nowhere to be found. Heyman explained that while Lesnar was in the arena, he had no interest in going out into the ring. With Brock Lesnar advertised as the main event of this week's Raw, general manager Kurt Angle was fed up with Lesnar's stubbornness and gave Heyman an ultimatum: If Lesnar didn't show up in the ring Monday night, Heyman would be fired on the spot. Heyman tried his best to appeal to Lesnar, but it appeared to be completely ineffective. Despite their years-long partnership, Lesnar had zero interest in Heyman's pleas and made it abundantly clear that he just wanted to be left alone. As Monday's Raw came to a close, Lesnar was nowhere to be found and Angle was furious at Heyman for failing to follow through on his promises. Heyman could do nothing but try to explain to Angle that Lesnar can't be reasoned with. But when all hope seemed lost, Lesnar appeared—and he wasn't happy. First, Lesnar went face-to-face with Angle and delivered a devastating F5 to the general manager. But as Heyman chered him on, Lesnar grabbed Heyman and nearly choked him. It appears “The Beast” will be going into Summerslam without any allies. While Lesnar has defeated Roman Reigns before, his lack of recent in-ring experience may give Reigns the advantage he needs. Summerslam will air live from the Barclays Center in Brooklyn on August 19 only on the WWE Network. Chef's Tip: The more colorful your salad is, the more diverse its nutrient variety will be. In a large bowl, add all ingredients except dressing and feta. Add dressing and toss. Top with feta. Chef's Tip: To make your own bacon bits, use kitchen shears to cut strips into 1⁄4-inch pieces. Add pepper, then fry over medium heat until brown. In a large bowl, add all ingredients except dressing. Add dressing and toss. Everyone is always looking for quick fixes. No one wants to put in the work that creates lasting changes—which is what you really want in the long run. Right? So why do we sell ourselves short? I preach about the importance of putting healthy foods into our bodies and the benefits of exercise, but do you really know and understand what causes those benefits inside of us? I am going to target this article a bit more towards the ladies because they are the majority of my audience and some struggle to truly understand what regular weight training and eating healthy can do for you. Metabolism is what we want to boost when trying to lose weight because it is the control center for everything chemical that happens in our bodies. Think of our hormones, the way we feel, how much energy we have, and where we hold onto most of our weight. The higher our metabolism is, the more calories we burn. But when we destroy it when we go on crash diets or we yo-yo diet (bouncing around from diet to diet) we do our bodies more harm than good. Fortunately, there are a couple ways that work to get your metabolism back in sync. Food and our metabolism are connected through what is called the thermic effect of food (TEF), defined as the amount of energy required for the body to use and store food. Protein has the highest TEF, followed by carbohydrates, followed by fats. This makes having protein with every meal key to helping boost your metabolism. When it comes to choosing your proteins, think of your lean sources of protein: chicken, lean beef, turkey, fish, and eggs. Eating more protein also helps you to feel more full because it takes the longest to digest, hence boosting your metabolism through digestion and absorption. Protein is what builds the foundation of our bodies. If you want a strong structure, protein will help you. What happens if we don’t eat enough? Well, our bodies aren’t too happy. When we aren’t giving our bodies enough food to eat, everything I talked about above goes right out the door. Our bodies go into more of a survival mode and will store the food as fat instead of burning it for energy. If you are someone who exercises consistently (specifically weight training), there is pretty much no reason you shouldn’t be fueling your body properly. Ladies, I am calling you out because working with you for over a decade on nutrition, I have really had to get creative in helping you to understand the importance of fueling for weight and fat loss. Here is an example of what a one-day meal plan might look like for a client. Keep in mind this is a pretty basic meal plan to help get the point across. Each of these meals should have at least 25-40g of protein. As a female weightlifter, I can assure you that lifting weights won’t make you blow up into the female version of The Hulk. Aside from my love of talking nutrition, my next favorite thing to discuss is muscle. It is commonly known that muscle burns more calories than fat does. If you aren't convinced that adding muscle to your frame is for you, remember that a pound of muscle burns an average of 3-10 times more calories than a pound of fat. Aside from the positive effects, weightlifting has on the metabolism, it also has many other positive benefits such as helping to make your bones stronger. Ladies, we are more likely to have osteoporosis than men. Please help yourself by picking up something heavy and putting it back down on a regular basis. Why is this type of training so successful? It's because this type of training adds load to your muscles and this loading is what creates more muscle mass. The more muscle mass you have, the quicker your metabolism will become—which equals more calories burned! I typically have this type of workout in a timed circuit, but for this example, you can see that the first two exercises are strength training based and the last exercise is conditioning based. This is just a simple example of what a circuit might look like, but it has all the components of a metabolically effective workout. So ladies, if you could take anything away from this article, it is this: rip away your old beliefs that food makes us fat and that lifting weights is for The Hulk. Instead, work on adding more protein to your nutrition plan and add more weights to a weekly fitness routine. This video, above, shows the variety of ways that I implement weight training into my workouts. Think outside of the box and make it fun! If you are anywhere near Morgantown, West Virginia, come on by and join in with our Warrior Body classes, and if you're not, sign up to join us for our online fitness challenges. Did you hear that at last year’s Track & Field World Championships, just before the start of the 100-meter finals, Usain Bolt was told, “Your world record is 9.58 seconds—run any faster than that and you will be disqualified”? Did you hear about those two incidents? No, because neither happened. All sports follow the iconic “Faster, Higher, Stronger” dictum of Baron Pierre de Coubertin, creator of the modern Olympic Games, encouraging all athletes to constantly better previous performances. Only one sport seems to consistently grapple with putting limitations on human performance and is constantly immersed in discussing the issue of “How much is too much?” We’re talking about bodybuilding and fitness. We old geezers nostalgically look back on what we call bodybuilding’s Golden Era of the ’70s, when the physiques of Arnold and the gang at Gold’s Gym in Venice, CA, seemed to represent an aesthetic, acceptable, and attainable look that didn’t scare the children. However, Arnold recalls that Marvin Eder, Mr. America competitor of the ’50s, once told him in the early ’70s, “You guys have taken it way too far. It’s grotesque.” Sound familiar? Throughout bodybuilding’s history, the “How much is too much?” debate has raged. It manifested (or womanifested) most notably with the progression of women’s bodybuilding. While the ’80s physiques of Rachel McLish (the first-ever Ms. Olympia in 1980, who also won in 1982) and Cory Everson (six-time Ms. Olympia, 1984–89) kept within feminine dimensions, the ladies who came after them repped out with such drive and enthusiasm that they sculpted supermuscular physiques that caused their endeavors to dwindle in popularity to the point that there is no longer a Ms. Olympia bodybuilding contest. The same up-the-ante evolution occurred with the women’s figure class, which was launched in 2001. As the years clicked by, the figure ladies became bigger, harder, and leaner. A similar scenario occurred with the bikini class, which debuted at the Olympia in 2010. It seemed that progressively they became so devoid of body fat (a body- building prerequisite), with ribs showing, that some didn’t look too well on contest day. Mamdouh “Big Ramy” Elssbiay weighs 300-plus pounds onstage. Big indeed. And so, dear reader, we arrive at the present state of the IFBB Pro League men’s physique division. That “How much is too much?” conundrum seems to be growing—like the physiques themselves—in this division. The guys who first competed in this class back in 2011 look a lot different—less developed—than their current peers. In the eyes of many, they are bordering on straying into bodybuilding territory, with many of the competitors now heavier than past Mr. Olympias Frank Zane and Samir Bannout. Whereas shape and leanness seemed to be the initial main criteria, we now have competitors being issued advice from judges like, “You need more upper-back thickness” and “Put some meat on those delts,” which are similar messages to what the bodybuilders are being urged to do. How can these guys get even more muscular and bigger and still keep within the confines of how the men’s physique division was initially visualized? To be specific, the official IFBB/NPC rules state, “Judges will be looking for t contestants who display proper shape and symmetry combined with muscularity and overall condition. This is not a bodybuilding contest, so extreme muscularity should be marked down.” Well, increasingly, to these eyes at least, a lot of the MPD guys seem to be just a few reps and/or supps away from a bodybuilding physique. Which is not really a criticism. But again, the “How much is too much?” conundrum is raised as physiques in this division continue to get more muscular. One can chart the progress of four-time Olympia Weekend physique champ Jeremy Buendia, who completed his quartet of Olympia wins with a frame that packs much more muscle than was evident during his initial 2014 triumph. Which is not in any way a criticism of Buendia’s progression. In fact it’s rather the opposite, as he follows the precepts of “Faster, Higher, Stronger” like all true sportsmen. A key element of the human spirit is to explore new limits to see how far you can go, and the physique guys are in pursuit of that goal. The overall picture is maybe somewhat muddied by the 2016 introduction of the classic physique class, which offered an outlet for bodybuilders to compete within more “aesthetic” guidelines than is applied to their open bodybuilding brethren. However, the classic division introduced in 2016 does have limitations based on height and allowed body weight. Have we reached a point, a tipping point, where some level of constraint is on the horizon for men’s physique competitors? Sticking one’s neck out may be a precarious venture (ask Louis XVI of France), but speculation is as much a part of bodybuilding as “I wuz robbed” proclamations. So here goes. Whereas 10 years ago we had no inkling of the impact of the men’s physique or classic physique divisions, what will the bodybuilding/fitness landscape look like in five or 10 years’ time? The blunt truth is that the men’s open bodybuilding division is losing traction in terms of spectator attendance at pro contests—and in the number and quality of those entering their ranks. Plus, there has been a drastic reduction in sponsorship opportunities being offered to them. For the physique division, the opposite is true. That being said, there will always be an audience—albeit less than it was—for men’s pro bodybuilding. But is it possible that the classic and physique divisions will be fighting for preeminence in coming years? As a dyed-in-the-wool old fart and old-school zealot, I sincerely hope not. But then, I was one who said Velcro would never catch on. Short on time and short on equipment. Solving this dilemma and getting in a great workout requires two things: creativity and intensity. Both are brought to you by Firdose Khan, head trainer at Nine Innovations (ixinnovate.com), a training facility in Houston. We asked Khan to design three time-sensitive workouts. The rub? None could use more than a single weight plate—just the type of rudimentary training tool that may be lying around in your apartment or garage collecting dust. Khan delivered a trio of routines that are equal parts intense, functional, and physique-enhancing. They all hit every major muscle group, and as for intensity, it’s high. Each of the workouts utilizes the AMRAP (as many rounds as possible) technique, which means you’ll be challenged to the extreme. So dust off that weight plate and get ready to work. The following workouts can be done with any size weight plate: 5, 10, 25, 35, or 45 pounds. Choose whichever weight corresponds to your current strength and fitness level. (When in doubt, start light.) Select any one of the three routines and do it as a stand-alone workout, but aim to complete all three over the course of a week if possible—collectively, they train the entire body in such an effective manner that we wouldn’t want you missing out on any of the AMRAPs. Well, I am headed into the third trimester this week and that’s just nuts to me because it feels like yesterday I found out I was pregnant! This pregnancy has been similar, and yet different (hello braxton hicks contractions already!!! ), than my previous ones and I’ve had some requests to write a blog post on all of the products and things that I have been loving so far. This body pillow! I actually discovered this pillow through Naomi’s blog and I’m so glad I did because it has been a TOTAL LIFE SAVOR. It’s quite large but it’s soooooo comfy and I just wrap myself around it like I’m a koala bear on a tree at night. That’s a funny image but it’s the thing that pops into my head the most! Haha. Seriously though, if you’re pregnant, you need one of these. I have been sleeping better this time around than my other two pregnancies and I totally credit that to this pillow. Storq leggings. Okay, I am not one to bad mouth other brands, but let’s just say that over the years I have pretty much tried ALL the pregnancy leggings on the market and have always been let down. They either get all stretched out or get pilly after a couple washes. Or they itch?! What the heck. The last thing you want when you’re pregnant is to be in itchy leggings. Anyway, these are soft like butter and the very best I have ever tried. I literally live in them. They are sooooo soft and comfy and I either wear them with long tunics or just t-shirts. I really think they are comfier than my pajamas. I have a few things from this brand that I absolutely love and, let’s be honest, I probably will order another dress or two in a bigger size before this baby makes his appearance. I am a huge Storq fan – worth the money, friends! Vital Proteins Collagen Peptides. I put a scoop of this in my coffee every morning and can’t taste it at all. I love knowing that even with just one scoop (the serving size is two scoops), I am getting 10 grams of high quality collagen protein first thing in the morning. I also have tried their new matcha collagen and love it (it tastes like the more expensive matcha I had been drinking prior to getting this!). Surf Sweets gummies + sour worms. Keeping a baggie of these little organic gummies (sweetened with fruit juice!) in my purse during the first trimester really helped with some of the nausea I experienced. This was my first pregnancy that I felt nauseous most of the time during the first 14 weeks and these helped! I also tried the popular “preggo pops” but those didn’t really do much for me. Serola Belt. My midwives let me borrow one of these belts to help ease the discomfort with my pubic bone and it has really helped! I can’t say I remember to wear this every day, but on the days I do wear it, it really helps (more than anything else I have tried). I have a size medium for reference. Investing in myself. 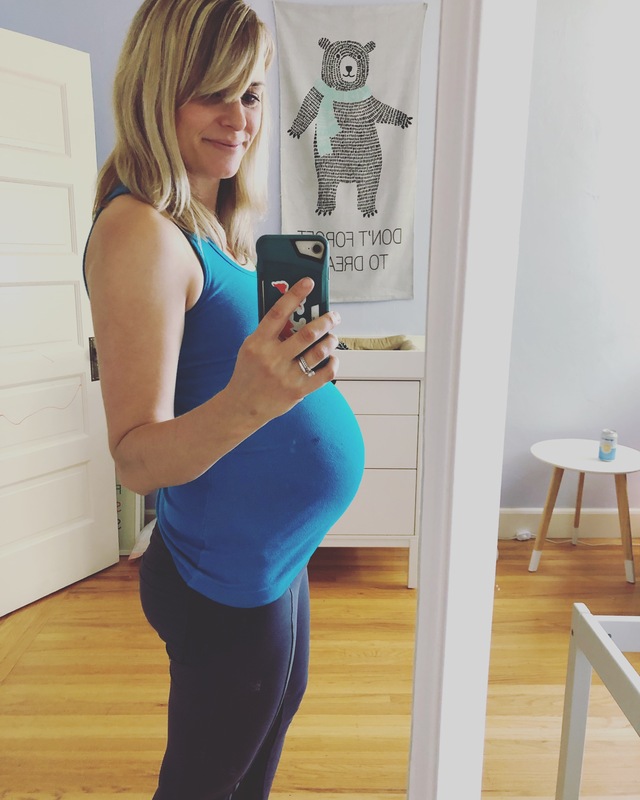 I feel like I have invested in myself more this pregnancy, whether that’s through groceries to my door, meal delivery services, take out for dinner, pedicures or new “fancy” body products. I’ve given myself the permission to spend a little more money than I normally would on what might seem like “extravagant” things for myself (pedicures really aren’t that extravagant but you know what I mean). It’s so worth it! Sometimes just getting that new body lotion in the mail…or having a bag of groceries show up at your door so you don’t have to drag your toddlers to the store for the billionth time when you feel like crud are just WORTH IT. I’m terrible at accepting help from others but I’m pretty good at online shopping. Hahaha ? I am busy taking care of my kids, keeping the house together, running a business and GROWING A NEW HUMAN so I refuse to feel guilty. Garden of Life Vitamin Code Raw Prenatals. I often get asked what vitamin I take so here you go! I have taken these through every pregnancy so far and like them a lot. I also take an iron supplement a few times a week, a daily probiotic and a magnesium supplement (natural calm). ALL of the peaches, berries, cherries, watermelon, grapefruit juice…..basically all fruit in general. ? I crave fruit every pregnancy and so summer is great time to pregnant for me! I feel like I’m saving money on not buying as much wine these days (haha) so I can put that towards tons of lovely organic produce! Unfortunately my kids are total fruit monsters, too, so I have to hide some of my peaches from them or they will all be gone within an hour of shopping. Spindrift. Oh my goodness, this is just the best sparkling water I have tried. I love the lemon flavor so much. It’s also Luke’s very favorite thing so we usually share one during “happy hour” ( aka all of us drinking Spindrift on the couch watching Mickey Mouse Clubhouse at 4:30pm). Giving myself a break. I guess this sort of goes along with investing in myself? I used to be VERY anti-tv for my kids. Then I got pregnant. LOL. But seriously, I would let Grayson watch a Daniel Tiger and then feel so guilty about it and beat myself up thinking all screen time is the worst thing ever. Okay, I had to let that go real quick! Now I realize how silly I used to be. Letting my kids watch an occasional program here and there has been vital to survival these past six months, especially when I felt so sick in the first trimester. Mister Rogers, sesame street and mickey mouse are not going to kill anyone…and provide me with a chance to rest with my feet up (or just lay on the couch with my eyes closed!). Giving myself a break also has to do with giving myself a break with exercise. The fact is, I’m just not really going to be working out as much as I used to be, and that is okay. Keeping my kids alive is my main goal these days and I bet I get plenty of steps in just chasing them around the house in the afternoons…this is just a season and one day I will be back working out and doing yoga and my kids will all be in school……. ?